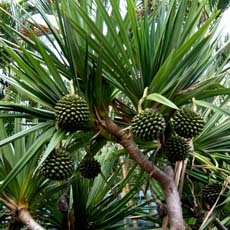 Pandanus utilis is perhaps the most popular screw pine in cultivation. Chosen for its attractive tall, robust, stilt-rooted trunk, and open-branched, spiralling crown of mildly spiny, light green or sometimes slightly blue-green leaves with very attractive red margins. Like most Pandanus - seeds are contained in keys with several seeds in one key. These keys are planted whole, and the seedlings are separated into individual plants at a later time.